Crowdfunding 2018 Predictions: The Next Real Estate Boom? Crowdfunding is estimated to have past $30 billion this year, up more than 150% from the amount raised globally last year. Thanks to new regulations allowing anyone to invest in projects, crowdfunding 2018 could easily top $60 billion and surpass some traditional forms of finance. Where is Crowdfunding Going in 2018? While peer lending continues to dominate the crowdfunding industry, rewards-based and equity crowdfunding are growing at a faster rate. The Securities & Exchange Commission passed final rules around the JOBS Act this year, allowing all investors to participate in equity crowdfunding, and we could see massive growth in 2018. Besides the sheer growth in crowdfunding, I thought it would be interesting to check out some of the predictions for crowdfunding 2018 around the web. The World Bank estimates that crowdfunding will reach $90 billion by 2020, a level that could be seen by next year if annual growth continues. It’s no surprise that crowdfunding and alternative finance continues to book massive growth each year. Traditional bank lending never really rebounded after the financial crisis due to stricter regulations on lending and capital requirements. Venture funding and angel investors have always been a closed door for many small business owners, investing in less than 1% of the proposals they agree to hear. Venture capital and angel investment groups invest upwards of $50 billion a year, which means crowdfunding is set to surpass them in importance in 2016. As crowdfunding moves from the ‘alternative’ to traditional finance, many have wondered how venture capital and other funding sources would react. We’ve already seen money managers looking to peer lending for higher return and I talked to a venture capital contact last week that said he is aggressively looking for projects in equity crowdfunding. Just as technology evolved social interactions into platforms like Facebook and Twitter, it is helping finance evolve into its crowdfunding form. 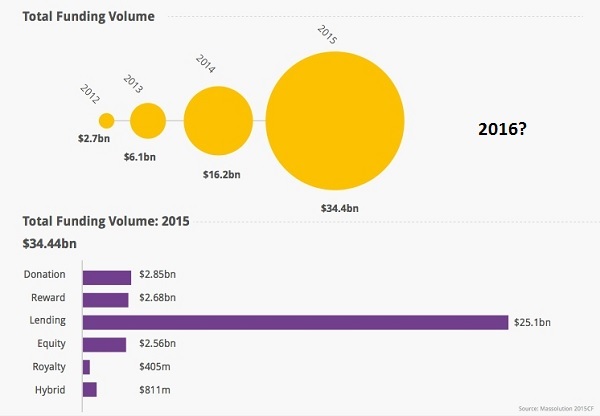 The number of crowdfunding platforms continues to increase despite predictions of widespread collapse and consolidation. David Drake, Chairman of LDJ Capital, uses several sources to estimate that the number of crowdfunding platforms could increase to over 2,000 by early 2018. That includes more than 230 real estate crowdfunding platforms alone. It’s true that a lot of these platforms are unprofitable on the amount of fees raised but the growth in crowdfunding volumes and investor attention ahead of final rules around the JOBS Act have kept funding coming in to support operations. We didn’t see platforms go dark as some predicted for crowdfunding 2015 but there’s still a good argument for consolidation and mergers in crowdfunding. Once crowdfunding growth stops doubling each year, early investors will look to cash out on their investment in platforms. We’ll see venture capital and angel groups buy up a lot of unprofitable platforms to integrate with their model. Real estate crowdfunding investing could come out as the real winner in 2018. As interest rates gradually move higher, real estate developers will need to look beyond traditional financing to fund their projects. Bank lending hasn’t been that strong anyway and higher rates will threaten some real estate projects. Real estate crowdfunding has been surging for the last several years and is estimated to reach $2.5 billion this year according to Massolution. 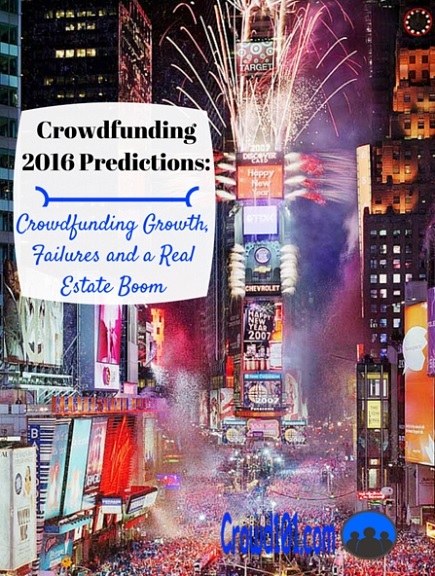 In fact, real estate crowdfunding was the largest growing segment of the crowd in 2015. Crowdfunding 2018 could easily see more than $3 billion in projects funded. Real estate platform Fundrise filled its $2 million offer for the industry’s first crowdfunded real estate investment trust and crowdfunding 2016 could be the year that non-accredited investors swarm into the space. 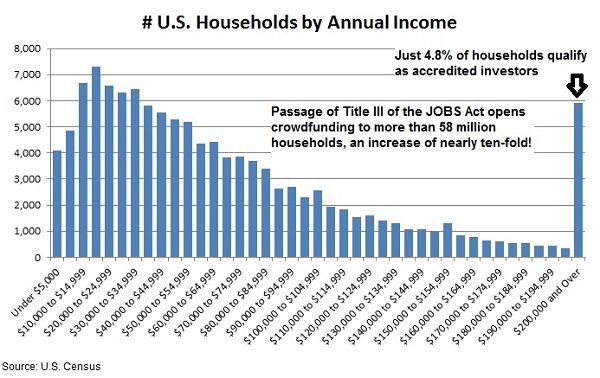 The new crowdfunding rules means you don’t need $1 million in net worth to invest in crowdfunded real estate and the market for crowdfunding investment is set to jump in 2016. Laws passed recently have opened real estate crowdfunding up even further to investors and it's looking like the next big thing in real estate investing. New crowdfunding laws have opened the door for sites like RealtyShares which allow investors a direct investment in real estate projects. The new opportunity has become a huge funding source for developers and a great investment. Unlike real estate investment trusts (REITs) where you are investing in a real estate fund, crowdfunding real estate is a direct investment in the property. Investments are professionally-managed but usually at lower rates than with REITs and other real estate investments. It's a new type of real estate investment but carries a lot of advantages over other forms including REITs and real estate investment clubs. Click for more information about investing on RealtyShares and the real estate crowdfunding opportunity. Besides the landmark rules that opened crowdfunding to all investors in the United States this year, several other countries saw progress that could make crowdfunding 2018 another record year. The Canadian Securities Administrators (CSA) adopted Multilateral Instrument 45-108 in May, expanding exemptions for equity crowdfunding and issuers. The new rules allow a higher offering limit, up to $1.5 million from the previous cap of $500k, and expand crowdfunding to reporting issuers as well as non-reporting issuers. Investments must be made through a registered crowdfunding platform and there are ongoing disclosure requirements with the new rules. Crowdfunding has developed more slowly in China where the China Securities Regulatory Commission (CSRC) has only recently started regulating equity financing platforms. Regulations are relatively tight for equity crowdfunding with investors required to hold net assets of RMB 10 million ($1.55 million) or income over RMB 500,000 a year. Despite strict regulations, the World Bank estimates that crowdfunding in China could reach $50 billion by 2025. Because of tighter investing requirements, crowdfunding has taken off more as a means of product innovation and development than for investment. China’s version of Amazon, Alibaba, launched Yu Le Bao in 2014 as an online platform to offer access to investment in TV and movie projects. Founders say the crowdfunding platform, which translates to “Entertainment Treasure,” is meant to get the public involved in the creation of Chinese culture by offering a chance to invest small amounts in production. This year saw the first regional Asian platform with CrowdPlus.Asia, based in Malaysia and operating in Thailand, Vietnam, Honk Kong and China. The platform is a partnership of Netrove Ventures Group, a regional tech VC firm, and Propellar Corporation, an equity crowdfunding operator. All national platforms are expected to be running by early 2018. What about the 2017 Crowdfunding Predictions? The market for initial public offers of stock slowed considerably this year and we didn’t get any major platform IPOs as hoped. I still expect an eventual IPO of one of the larger crowdfunding platforms, most likely Kickstarter or Indiegogo. The early investors in projects like these are not in the business of keeping a position in a company rather they like to build it quickly and then cash out. If the stock market rebounds in 2016, we may see a crowdfunding platform take advantage of the opportunity. While we didn’t see any IPOs, we did get the first eREIT (real estate investment trust) from crowdfunding platform Fundrise. The real estate crowdfunding company held a $2 million offer as part of a $50 million fund that will invest in mortgage loans from the platform. The shares are not listed but Fundrise has adopted a redemption plan that will allow investors to sell shares on a quarterly basis. With the growth in real estate crowdfunding, I’m sure this won’t be the only real estate crowdfunding ‘fund’ for long. Crowdfunding 2018 looks to be another year of record growth though new regulations have yet to be fully adopted by equity platforms. As the stock market stumbles in the last few weeks of 2017, it might provide the investor demand for crowdfunding that could propel the industry even faster.